Based on an end user request, we have added the ability for some basic formatting options of message lines when entering and printing a quote from Advanced Accounting 7i which will be available in the next release. As a result, two new group boxes in the line item entry section have been added as outlined below. The report output font size normally is 9pt and the larger T size will cause the message line output to instead be in 14pt. Further, for both the regular and larger font sizes, formatting options can be selected that include bold (B), underlining (U), or both bold and underlined (BU). 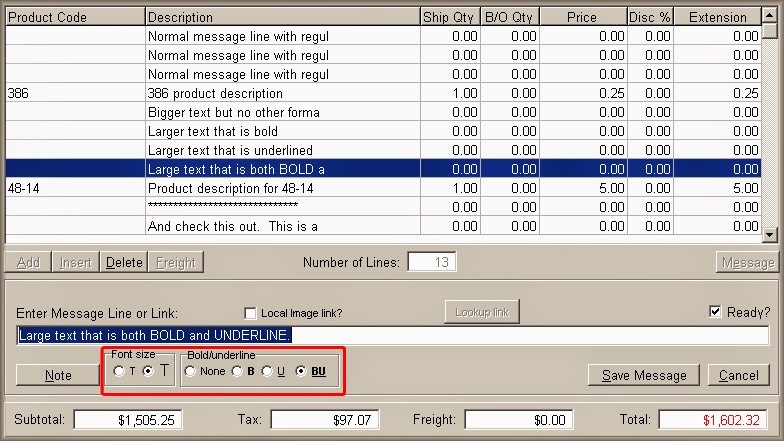 When the larger text option is selected, the message line text is aligned with the product code column rather than with the product description to allow for the additional space required by the increased font size. When sent to a printer, the output normally will match the preview as above. Conversions to PDF files (available directly within the software and which automatically occurs when choosing to e-mail a quote), can result in slight differences. For example, if the underline option is chosen, the underline may extend all the way to the right and not just under the text. Message lines can be "attached" to notes rather than just single text strings. (This is true also in connection with purchase orders and sales orders/invoices). When these new formatting options are applied, notes attached to message lines will be formatted accordingly (see image above for an example of a note that has been selected to be in a larger text size and in bold). 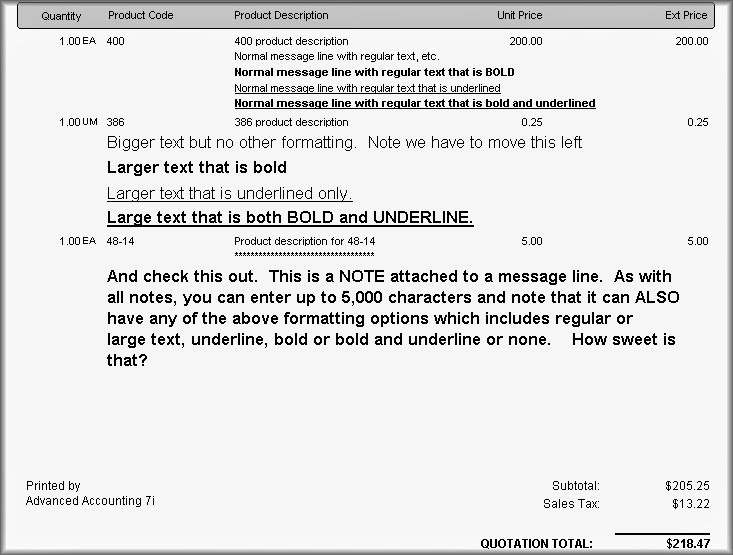 A better way to describe this kind of message line might be a message line note, or a message line that is "transformed" to a free-standing note that is not attached to product/item code (notes that instead are truly "attached" to product code lines will continue to print as they have in the past and are unchanged). These new options allow the user to emphasize certain conditions or contingencies that often apply when providing estimates. These same options could be added to sales orders/invoices and to purchase orders in the future depending on end user interest. This is a non-critical alert or warning message. If you are submitting a file on behalf of your own company, then the Submitter EIN and Employer/Agent EIN are in fact going to be the same. Nothing in that event is wrong. In an era where employers are being encouraged to upload their information electronically, it is somewhat peculiar for end users to encounter this sort of warning which presumably is designed more to help tax practitioners catch mistakes prior to submitting files on behalf of others.